This home on Forest Avenue was built for a specific purpose: to be the home of several prominent school teachers who shared it in 1904. The teachers lived one block off of Troost, close to the busiest streetcar line and near shops, grocery stores and other businesses that served the neighborhood. On the 3600 block of Forest, most of the homes looked fairly similar when they were built around the turn of the century. But one of them housed not the typical family; it was constructed to be the residence of several prominent Kansas City teachers. As part of our Uncovering History Project, the Midtown KC Post is taking a look at the 1940 tax assessment photos of each block in Midtown, including a set of 1940 tax assessment photos which is available for many blocks. (Many people seem confused by the tax assessment photos, which all include a man holding a sign. Here’s the story behind them). The Linwood School around 1890. One of the teachers, J. Kate Biggs, was the principal of the Jackson School beginning around the turn of the century. Roommate Mary E. Flavin taught at Woodland. Emma J. Lockett had a long career as a teacher and then principal of the Linwood School at Linwood and Woodland. The county school opened in 1870 as a one-room wooden schoolhouse in the middle of what was then farm land. Just across a narrow country lane stood a 20-acre apple orchard. When the school had festivals or other events, people traveled by wagon, horseback or buggy to the tiny school. 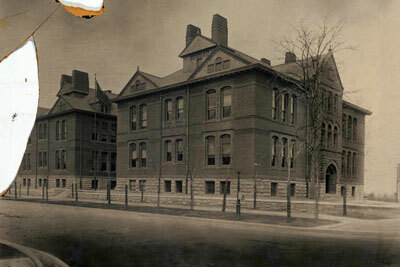 The Kansas City school district annexed the school and changed the name to Linwood in 1890, and began construction of a new eight-room school. Miss Lockett was the only teacher when she began at the school. As the school grew, she became principal and by 1899 had thirteen teachers reporting to her. 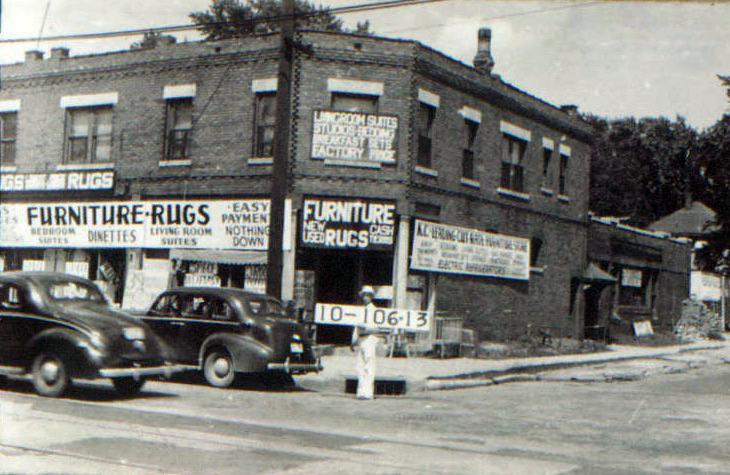 A business at the corner of Troost and 37th in 1940. 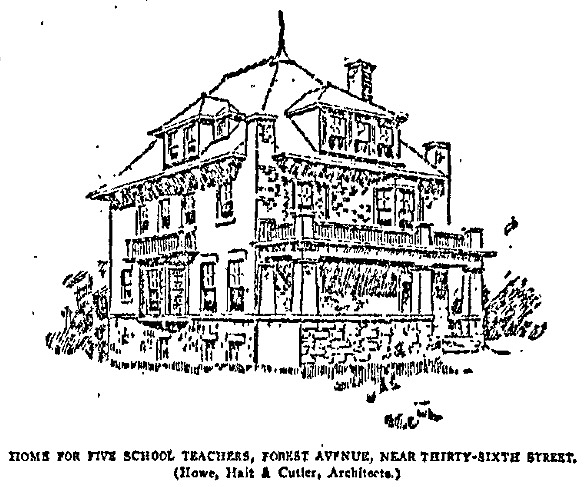 Census records show four teachers – Lockett, 54; Biggs, 57; Flavin, 51; and Mary Schmidt, 50– living in the Forest Avenue home in 1910. They were still there in 1920. 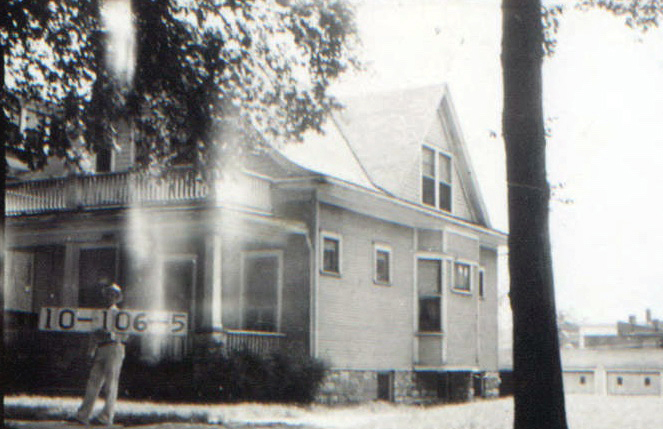 By 1930, three of the teachers (minus Miss Flavin) had moved to 4054 Campbell. The slideshow below shows the rest of the homes and businesses on this block of Forest and Troost as they looked in 1940.